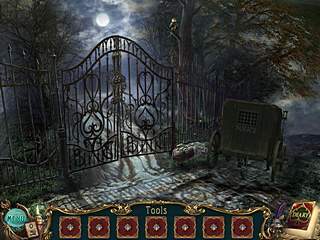 Playing Haunted Legends: The Queen of Spades you'll be sourrounded with the specific Russian ethnic flavor as the plot of the game is based on a story by famous Russian writer and poet Alexander Pushkin. When the game starts you find yourself at the entrance of the countess’ mansion. You’re an inspector and have to investigate the mysterious disappearances of several people. According to the rumors you’ve heard the countess whose house you’re visiting has a powerful set of magic playing cards and all the people who entered her abode before (except your fellow policeman who was the last one to disappear) had been allured by those cards. Actually you’re not the lucky one to resist the temptation of the cards so you decide to gather the pack. As you might already guessed all the 52 cards are scattered around all the locations. And as for the locations – there are lot’s of them not only inside the mansion, but always outside. You’ll have to visit the city as well and even float over a kind of river to get to the other part of the countess’ estate. And I bet that at least once you'll regret that you don't have any kind of map. 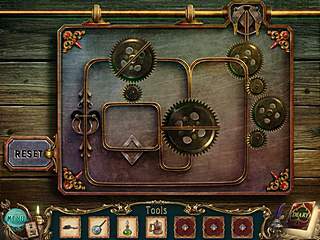 Haunted Legends: The Queen of Spades is a mixture of a detective, adventure and hidden object game. You’ll spend your time mainly walking back and forth gathering different items to use them somewhere else. To tell the truth the inventory panel is so large, that from time to time I forgot what had I picked up and what was more it was not always clear where to use some of the objects. For example I found to wooden articles – the one had a groove and the other looked like a simple stick. Only the Strategy Guide that is built in the game revealed the destination of these odd things that I tried to put in every fireplace or campfire. Uniting them gives you a jack to lift an old carriage. For the fans of the HOGs Haunted Legends: The Queen of Spades might be a nice option for an evening or even two (the game took me more than 4 hours to play): all the scenes are clear and the items are easy to distinguish. Do you remember about the Russian motives I mentioned before? In the HOG-scenes you’ll enjoy them in full. You’ll be asked to find the Russian dolls, wooden spoons, eggs (meaning Fabergé eggs) and many other things that will tell you about their Russian origin. Besides you’ll find even a man in hussar uniform! And being surrounded with that entire specific Russian ethnic flavor, you’ll run against a strange countess’ assistant that reminded me of Dobby from the books about Harry Potter, but only a spiteful one. Searching for the objects get prepared that in every scene there is an object inside something (try to open everything you think might be opened) or an object that can be obtained by means of some manipulations. For example in one of the lists you’ll be given a cup of hot water, but on the screen you’ll see a glass in a holder and a samovar. But if you take a glass in a holder and put it near the samovar and afterwards open the spout, you’ll get what you need! The graphics of the game are wonderful mainly to its reasoning in details. When you click a hint button during the HOG-scene the item is showed by surrounding it with the cards. And if you’re misclicking too often and abuse the random clicking your cursor will be come apart like a scattering set of cards. The music is as good as the graphics. And there is no wonder as its author made the soundtracks for Dark Tales, PuppetShow, and Redemption Cemetery, as well. Hardly Haunted Legends: The Queen of Spades can surprise the experienced players, but the game is well-done in terms of the plot and artwork. 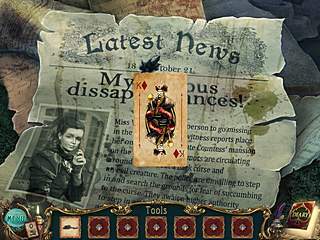 This is Haunted Legends: The Queen of Spades for Mac review. Download this game here.